Hello! 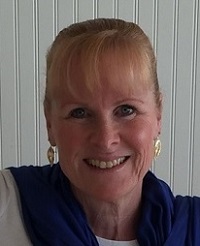 Donna Fasano here. Did you know that Sweet Romance Reads has a Twitter account? We do. Did you know that the authors of SRR are on Twitter? We are! What's that? You've never heard of Twitter? Twitter is a news and social network where users post about all sorts of things and interact with each other online. Posts are restricted to 140 characters. That might sound difficult, but it actually makes for fast-paced fun. If you aren't on Twitter, you can sign up here. Pictures are allowed; in fact, I encourage the use of colorful, eye-catching pics and memes. You can also use hashtagged words such as #SweetRomance or #AmReading... the list of hashtags is endless (just for fun, try plugging in #recipes, #inspiration, #quotes, #knitting, #gardening). Hashtags are a great way to find people with whom you share a common interest. I have met and interacted with people from all over the world. If you already use Twitter, or if you decide to open an account, here’s a list of all our Twitter @s so you can easily click and follow SRR and the authors. Do you enjoy social media? Or do you find it overwhelming? I used to find it overwhelming, but I’ve learned not to let it make me feel pressured. I realize that I can't read and respond to everything. So I just use it the way it was intended… for pure enjoyment! What social media do you use? What’s your favorite? 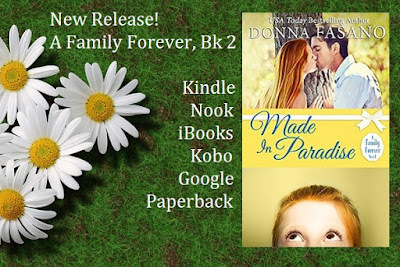 About the author: Donna Fasano is a USA Today Bestselling Author of sweet romance, contemporary romance, and women’s fiction. Learn more about her at her website. 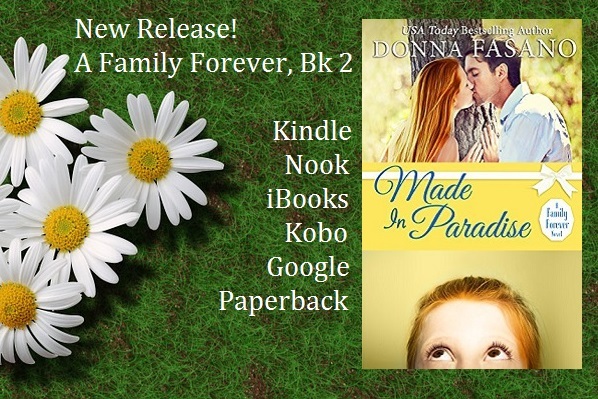 Her newest book, MADE IN PARADISE, is a sweet romance available for Kindle, Nook, Kobo, iBooks, Google, and also in paperback. I sometimes feel overwhelmed by all the social media, also. You definitely have the right idea...for pure enjoyment! I love social media, and I love promoting other sweet romance authors, so thank you for providing all the twitter addresses. I think I already follow most, but I'll certainly check the list. Here's to pure enjoyment! Thanks for the tips. I didn't know how easy it was to use hashtags. I'll have to try it with all sorts of different words.